On Tuesday July 16, our good friends at Pirates Cove Whale and Seabird Cruises photographed a right whale mother/calf pair right in the middle of the Grand Manan Basin in the Bay of Fundy! The photographs were sent to us at the Aquarium, and researcher Philip Hamilton matched the mother to Catalog #1946, a 24 year-old now with her 5th calf! She and her newest calf were first seen on November 27 off the coast of Georgia (there were quite a few early births this year). 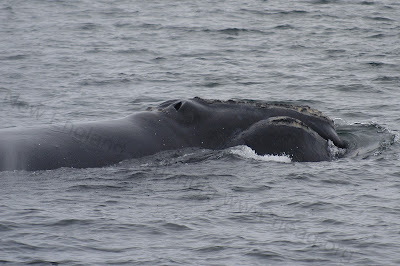 As far as we know, the pair were not seen off Massachusetts this spring, so this sighting is the first evidence that the calf survived the long migration, as well as the first reported 2013 sighting of right whales in the Bay of Fundy. The New England Aquarium Right Whale Research Team is in the final stages of preparing for field work out of Lubec, ME, by organizing and packing equipment and taking care of logistics—there is never a flurry of emails quite like pre-field season communication! Our surveys will start in early August, and marks our 34th year monitoring and studying right whales in the Bay of Fundy. We hope our readers are just as excited as we are, and that you'll take the opportunity to follow us on Twitter (@rightwhalescoop) and through our Facebook Group!